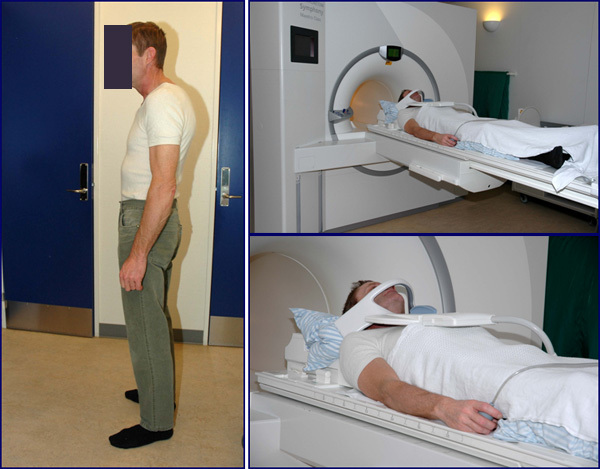 MRI is based on a strong magnetic field, special coils, the body's protons and an energy pulse (RF signal) to change the magnetic equilibrium in the tissues. The images are formed by collection of pulse signals in the coil when the tissues return to the equilibrium stage. MR is without known risk except a potential risk when Gd. contrast is given to patients with severely reduced kidney function. Disadvantages of MRI are that the examination takes relatively long time and MRI is not possible in patients with pacemakers, magnetic clips on aneurisms, claustrophobia etc. 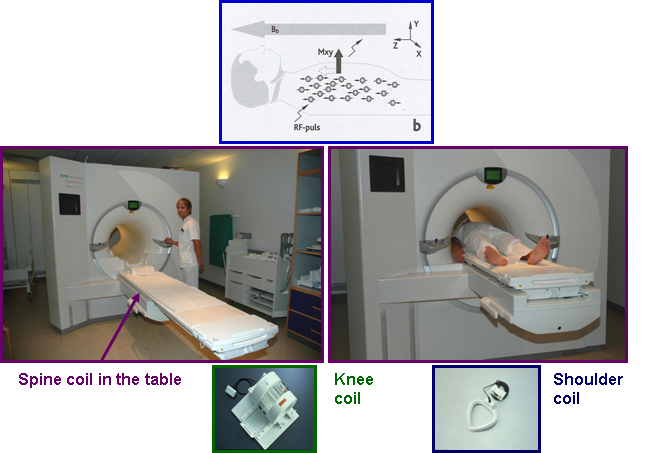 The MRI coils used for image formation depend on the area examined. The coil for spinal examination is usually placed in the scanner table while examination of smaller joint areas, such as knee and shoulder, requires a dedicated coil to be placed in close contact with the area studied. Examples are shown below. When the spine is excessively curved, it may be difficult to obtain good contact between the neck and the table containing the spine coil. This will result in a poor image quality corresponding to the cervical vertebrae unless a supplementary coil is placed anterior as shown on the image below.